Paradise Palms has been a favourite bar of mine for a long time, I’ve always loved its quirky décor. But did you know they also serve up delicious Vegetarian and Vegan food? Lucky Pig at Paradise Palms will have even the biggest meat lovers convinced they can go a meal without meat. The menu at Lucky Pig is entirely Vegetarian and Vegan, but trust me even if you are a meat lover you will love everything. While I’m not vegetarian, I mainly eat pescatarian and treat myself to meat once or twice a week max, so I love when restaurants offer an exciting array of vegetarian options. 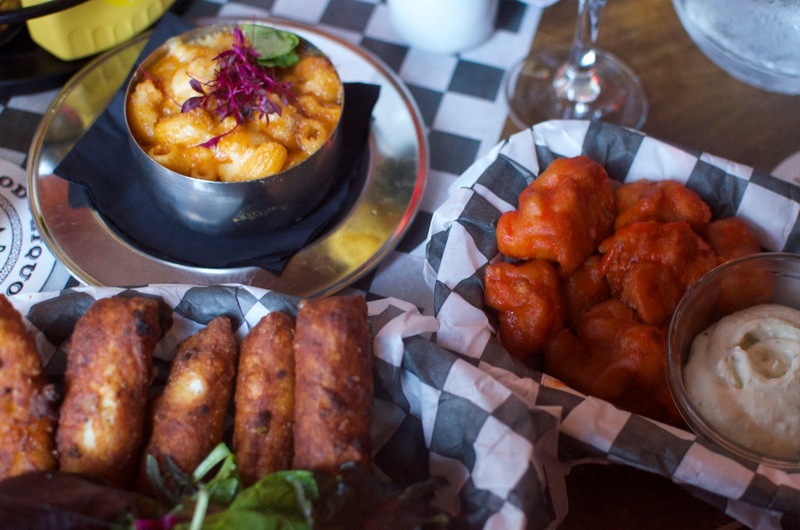 The soul food inspired menu is a combination of big dishes and wee plates, so whether you want a full meal or just something to nibble on with a drink there’s something for everyone. The big dishes include burgers, veggie hot ‘dawgs’, nachos and mac and cheese. These classic pub foods have been given a soul twist. The burger is a black bean and seitan burger, the mac and cheese features a mild smoky chipotle sauce, and the nachos can come topped with an animal-friendly alternative to pulled pork; pulled jackfruit. 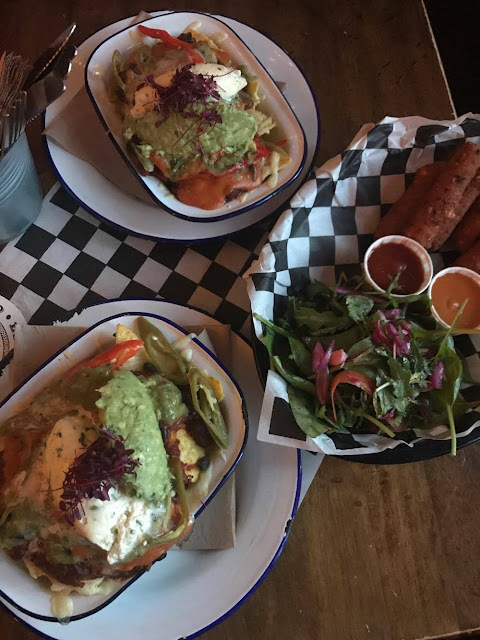 At the moment, Lucky Pig have an amazing 2 for 1 deal on nachos every Tuesday, which is so great because the nachos are one of the highlights of the menu. The Lucky Nachos come loaded with cheese sauce, delicious 3 bean chilli, fresh salsa, sour cream, cheddar, and sliced jalapeños. I don't know if it's house quickly I wolfed them down (Tuesdays do now have a long wait for nachos as everyone is obviously ordering them) but I didn't have too many soggy crisps (as you so often do in Nachos) which was a nice surprise given the cheese sauce. I loaded them even further with optional guacamole which is a pretty decent one I might add. I think I'd go as far as saying they are in my top 5 nachos in Edinburgh currently, I'd definitely recommend heading down there on a Tuesday. They have V. Lucky Nachos as a vegan alternative, Jackfruit Nachos as well as Bare Nachos if you just fancy a little snack on the side. 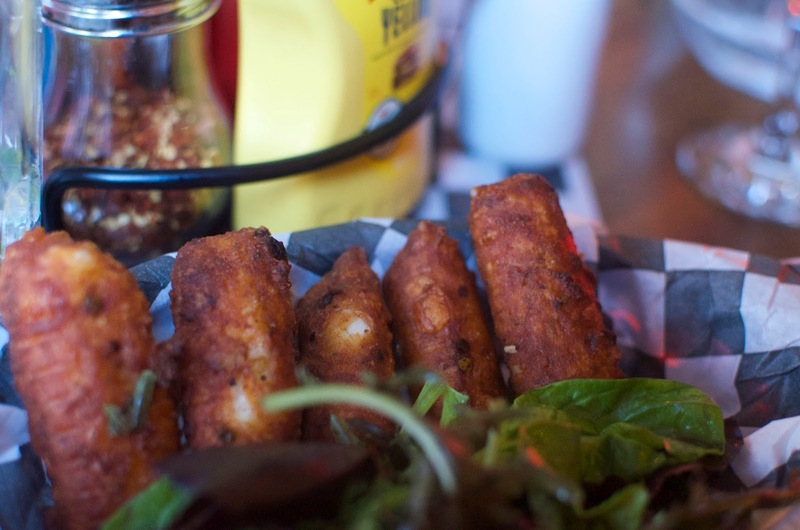 If you’re as into cheese as I am, you will LOVE their southern fried halloumi bites. I have had them twice and once they were probably the biggest wedges of halloumi I've ever seen and I was in heaven. The second time I was there they were normal 'mozzarella stick' size which was a little disappointing, but I wasn't surprised they were smaller as they were HUGE the first time. (Still hoping when I go again they will be back to huge) The crunchy Cajun spiced coat on these is absolutely delicious and goes great with the Buckfast BBQ sauce and chive sour cream that comes with them. The chipotle mac n cheese is also delicious, a mixture of four different cheeses and the mild smoky chipotle sauce gives it a bit of a kick. Another highlight of their menu is all their homemade dipping sauces that are all vegan and gluten free, including a vegan garlic aioli and a Buckfast flavoured BBQ sauce. My personal favourite is the chipotle mayo. The menu as a whole has so many vegan and gluten free options, and if their dishes aren't already, most have alternatives to make them VG or GF. In my group of friends I have at least one vegetarian and one gluten intolerant so Lucky Pig is a great place for me to go for drinks and nibbles with them and it keeps everyone happy. And as a meat eater myself, I can safely say I didn't once miss the meat. (I haven't yet tried the vegan options because you know me, I can't resist the cheese). Overall, I'd recommend Lucky Pig to everyone whether you're a meat eater or not. Give the pig a break for one night and check out Paradise Palms' website for the full menu.